You may or may not remember, but I decided to make my focus word for 2015 the word "positivity." I talked a lot about it in this post, but basically I wanted to focus on being more positive in my every day life. My journey to becoming a more positive person is just that. A journey. I've done a lot of reading and research to help me. I have found that there are some strategies that I have acquired over the past six months that help me to become a more positive person. Sometimes being positive comes very easily. Sometimes life takes a big dump on you and it is a little harder to be positive. On those days you just have to make the choice to be positive. Find the silver lining in your situation. Not every thought and feeling has to be put into the category of positive or negative. They can just be. Once I realized that I didn't have to categorized every feeling, I realized that I was dwelling less on my negative thoughts and emotions. Once you start to get the hang of it, reinforce your positive behavior. I like to journal, as well as spend alone time to enjoy my good mood. Other activities to try include meditation and physical activity. Now I want to talk about a really exciting series and link up that some of my friends and I have started! We are going to be linking up every other Monday with some really fun prompts about real life and positivity! 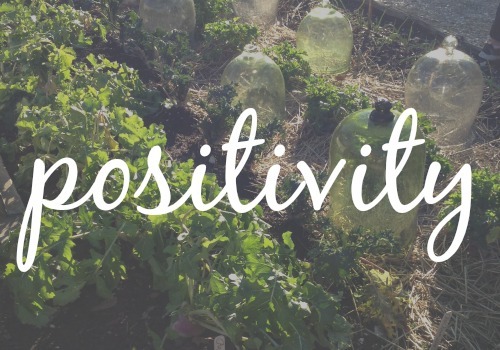 Our prompt for this week is "Steps I take to be A More Positive Person," so if you'd like to link up, I would love to see what your thoughts are! These are all perfect! Making the choice is the toughest one for me... But if you get that right, the rest seems to come easy. I love your second point, too. I'm definitely a "labeler." I really like the idea of not labeling your thoughts. Having the outlook makes it easier to ignore the potentially negative thoughts because it makes them kind of irrelevant. These are great tips! Making the choice to be positive is a tough one but so important. Gooood post! I'm excited for the wonderful stuff from this link up! Journaling is often a way for me to let go of my negativity. I jot (scribbly angrily) down my negative thoughts, and they don't seem to consume me as much afterwards. This is great! It's so hard to be positive sometimes and it really takes effort but it's so worth it! Love the linkup idea! Thanks! I really have been working at it, because sometimes I can get tired and be a little bit sour. But it has definitely helped to make the choice! I think once you make the choice, your outlook definitely changes. I think I get caught up in my hectic schedule, and sometimes I forget to look at the bright side. But focusing on it has made all the difference! I really need to try journaling. I almost always talk to my mom when I'm driving home from work (which takes about 20 min), but I think something like journaling would be a much better outlet. Do you just write, or doodle, or anything else? I am TOTALLY with you. I was to a point last summer and this winter where I felt like I was just being SO negative all the time. I felt like I was becoming someone I wouldn't want to be around. So I picked "positivity" as my focus word this year, and while it has been hard, it has been so worth it. Definitely important. And worth it!! Definitely. And they become more passing. I don't dwell on them as much, because I'm less focused on "OMG I'm being so negative/having so many negative feelings"
Me too. I think making the choice is easy, but you have to continue to make the choice every day. I might wake up in a foul mood, but I need to continue to be mindful about being positive. Both! Sometimes it means furiously scribbling profanities. Better in my journal than coming out of my mouth.